America is the ultimate start-up venture – and these are the heroes who made it happen.The history of the United States is, to a remarkable degree, the story of its entrepreneurs, those daring movers and shakers who dreamed big and risked everything to build better lives for themselves, and their fellow Americans. 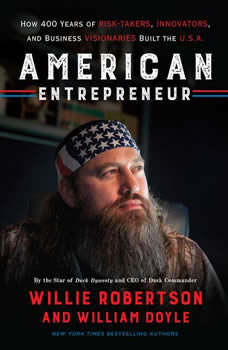 In American Entrepreneur, Duck Commander CEO and star of the blockbuster Duck Dynasty series Willie tells the captivating true tale of the visionaries and doers who have embodied the American Dream. We begin with the first American entrepreneurs, the Native Americans, who established a highly sophisticated commercial network across the land in the precolonial days. The original Founding Father, George Washington, was also a founding entrepreneur, at the head of a thriving agri-business venture that gave him the executive skills to steer the nation through the darkest hours of the revolution. Then, of course, there were the Mega-entrepreneurs, legendary figures like Astor, Vanderbilt, Carnegie, and Rockefeller, who transformed America, connected the country with miles of railroad track and supplied the fuel and steel that would help make this country the most powerful nation on earth. And in recent years, business visionaries from Jobs to Gates to Zuckerberg, not to mention the thousands of equally vital, yet smaller-scale, operators that spring up every year, have ushered America into the 21st century.American Entrepreneur also relates the story of the Robertson family business, telling how Willie’s family turned a humble regional duck call manufacturer, founded by his father Phil, into an international powerhouse brand. From a young age, Willie had the entrepreneurial bug, buying candy in bulk and hawking it on the school bus. He did special orders, offered revolving credit plans, and earned a small fortune for a ten-year-old—until he was hauled into the principal’s office and told to knock it off. So he transferred his focus to Phil’s fledgling business, helping in whatever way he could, from folding endless numbers of cardboard boxes to acting as the company’s customer service department—though he still wasn’t out of grade school. Willie helped build Duck Commander, which he now runs, into a worldwide brand, culminating in the mega-success of the Duck Dynasty television show.American Entrepreneur tells a most American tale, of those among us who through their vision, ingenuity, and good old-fashioned hard work, made something that changed the world.